The United States Congress designated the Upper Bald River Wilderness (map) in 2018 and it now has a total of 9,038 acres. All of this wilderness is located in Tennessee and is managed by the Forest Service. The Upper Bald River Wilderness is bordered by the Bald River Gorge Wilderness to the north. The Upper Bald River Wilderness, along with the existing Bald River Gorge Wilderness (designated in 1984) constitutes most of the Bald River watershed. This beautiful and rugged landscape is dominated by hardwood forests and is traversed by the Benton MacKaye Trail, the Brookshire Creek Trail and the Kirkland Creek Trail. These trails are open to and frequented by both hikers and horseback riders. The area is also popular with both hunters and anglers, and is home to sizable populations of Black Bear, White-tailed Deer and native Brook Trout. The area serves as the headwaters for the Bald River, including numerous tributaries and the upper portion of the river. 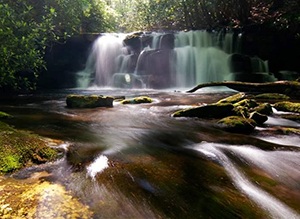 Tributary streams including Brookshire Creek, Kirkland Creek, and Waucheesi Creek are part of an important and popular trout fishery that includes the entire Bald River drainage and the Tellico River. The area is also home to a dizzying array of flora and fauna, the type that makes the southern Appalachian Mountains a biologically diverse temperate forest. Planning to Visit the Upper Bald River Wilderness? How to follow the seven standard Leave No Trace principles differs in different parts of the country (desert vs. Rocky Mountains). Click on any of the principles listed below to learn more about how they apply in the Upper Bald River Wilderness.